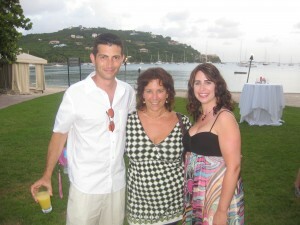 Interfaith Destination Wedding: Jen and Ilan in St. John … Amazing time in paradise! I just got off the plane from St. Thomas, and I’m so filled with love and joy from the amazing Interfaith destination wedding in St. John, that I just had to write about it right away, even though I have a million blog entries to write that are past due..well, maybe not a million..but you get the point! Last night, Jennifer and Ilan were married at Hawk’s Nest Beach, on the magnificent island of St. John. They are a Chicago Interfaith couple that found me online, and from the moment Jennifer and I spoke, we knew we were going to have a great relationship, and once again – it couldn’t have been better! Jen and Ilan weren’t the “average couple”. They first began planning marriage back in 2001, when they were pregnant with their first child, but as many couples find – life was already presenting them with challenges they weren’t quite ready to face. So, they decided to put their Interfaith wedding on hold, and went on with their lives, learning the lessons and gaining the maturity they needed to make the commitment to each other. Many thought that might never happen, but on Tuesday, June 29th, the day finally arrived. Jennifer, Ilan, Jamie, and Michelle walked down the aisle together! I loved getting to know Jen and Ilan, as well as their family and friends. After hearing about the bumpy roads they had endured, and getting a sense that this bride and groom couldn’t possibly have been more different from each other, I wasn’t quite sure this was a match made in heaven. That just goes to show us that sometimes, our initial impressions couldn’t be more wrong, because after spending 3 days with them, I have realized that they really were made just especially for one another, and that the work of G-d is a wonderful miracle. We all had so much fun together! As we were making plans for their Interfaith destination wedding, Jen kept talking about the villa. I’m assuming a villa meant a little townhouse, but again, dead wrong was I! I arrived at The Westin for their rehearsal dinner, and afterwards, Jen and Ilan brought me back to the villa, along with the rest of their bridal party. We walked into PARADISE. The Rhapsody villa in St. John is absolutely the most beautiful place I have ever seen, and perfect for group relaxation, family gatherings, and parties! You simply have to check this place out! Jen’s family and friends were a blast to hang out with. I spent most of the weekend with Cheryl, their cousin, and friends Julie and Margie, and Rick and Paul. Rick and Paul were nicknamed “Cabana Boys” because anything any of the girls wanted, they were there to provide, and they were 2 of the nicest guys I’ve ever met at an Interfaith destination wedding, or any wedding I have officiated! The families got along great together, and everyone was there to celebrate the joy of Ilan and Jen finally getting married! The Interfaith wedding was held about 10 minutes from the villa, at Hawk’s Nest Beach. In about 5′ of sand, and about 98 degree temperature, (but who was noticing?) under my made-to-travel-chuppah, Jen and Ilan finally got married. On Wednesday, we all gathered for brunch, and it was already time to leave. I can’t wait to see the pictures, and to see Julie, Margie, Jen and Ilan again when I go to Chicago in November. I was so sad for this beautiful Interfaith destination wedding to come to an end, because I know that in real life, we would all have been such good friends. But, that’s what makes my job so amazing – is that I make and keep friends all over the world, and these are friends I know will be around for a long time! Love you guys, miss you much and can’t wait to see the pictures! 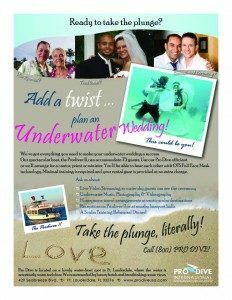 Yes, you heard right, underwater weddings! Suffice to say – there is a long story about how this all came about – but…. Yes, I am the first Cantor and Rabbi to become certified in performing weddings underwater! Using full Guardian scuba face masks, and through ProDiveUSA in Fort Lauderdale, we are going to be offering full communication and video streaming technology (check out my other Jewish interfaith wedding videos page). I’ll post more about how this all came about, but the Sun Sentinel and South Florida live are coming out on Monday to do a story on our underwater weddings, so I wanted to get this out there right away! We’re looking for our first Interfaith couples, AND a Catholic priest to be my partner in officiating Interfaith weddings under water! A Beautiful Day for a Sister’s Interfaith Wedding! So, no sooner did I finish Jared’s Bar Mitzvah, that it was time to prepare for the exciting upcoming week! First stop: Greenville, NC, where I had the pleasure and privilege of officiating the Interfaith wedding for Leigh and Matthew. Leigh is Meridith’s sister, whose wedding ceremony I officiated back in December of 2007. The family has become very special to me over the last couple of years, so it was really even more of an honor for me to do Leigh’s wedding. Shortly after Meridith hired me for her Interfaith wedding ceremony, they found out her Mom had brain cancer, and she was going in for immediate surgery. Joann recovered from surgery, and happily was able to celebrate her daughter’s wedding, and I admired her so much for her incredible strength. She was a beautiful woman, and I was so happy she could celebrate that joyous time. A year ago, Elliot emailed me to let me know that his second daughter, Leigh, was getting married, and asked me if I could also co-officiate with Matthew’s childhood Minister, Lisa. I was thrilled, and together, Lisa and I created a perfect Interfaith wedding ceremony – a blend of both Leigh & Matt’s backgrounds and faiths. But sadly, by November, Joann had passed away. Elliot assured me that Joann had been able to help Leigh make all of her plans, and though she wouldn’t be able to celebrate Leigh’s most special day, she did everything she could to make sure it had just the right touches, and that – it did. Leigh made a beautiful bride, and Meridith was a magnificent matron of honor. Matthew is the most adorable young man, who also works for Elliot, and adores Leigh with all of his heart and soul. It was sad to be without Joann, but I couldn’t be happier that the family is doing well, and enjoying all of the simchas that life brings. Meridith and Kevin are proud parents to baby Rose, and Leigh and Matt are starting their lives together, and hopefully, they will also soon be blessed with children. I feel so honored to be such a special part of this family, and I hope we continue to remain special to each other. Leigh & Matt, I wish you all the blessings life holds, and may your lives together be blessed with joy, health, and abundance. Another Interfaith Destination Wedding, this time a perfectly blended, earthy, universalist-style destination wedding ceremony in Puerto Rico, has come and gone, and this one went WAY too fast! I know I say this all of the time, but I am just so fortunate in that every one of my wedding couples is amazing – but truly, Eden and Eduardo were such an amazing Interfaith couple in so many ways. It was such a great experience getting to know them, and to be such a special part of their most special day. Eden and Ed live in Washington, DC, and they were referred to me by Rabbi Lev at www.interfaithfamily.com. As soon as Eden contacted me, we both knew right away we were going to be the most perfect match, and we definitely had that assumption right on all counts! Eden has one of those personalities that just comes right through the phone and you imagine that girl in junior high school who was just bursting with enthusiasm sitting next to you with a GREAT BIG SMILE on her face, and energy that would last for days. Well – that’s EXACTLY what you got with Eden! As I was writing notes about the feelings I had about her and Eduardo as we had our conversations on the phone, I kept thinking “earthy, warm, syrup-y, and sweet”. Again – I totally had it right! Getting to the destination wedding venue wasn’t quite as easy as forming the initial connection, but it was a fun and conversation-sparking adventure nonetheless. They were married at The Villa Montana, in a small town, in the north-western part of Puerto Rico, called Isabela. It was about a 2 hour car ride from the San Juan airport. Well, I was supposed to depart Fort Lauderdale at 6 am (ick), but I just happened to check on my flight the night before, and found out that flight no longer existed. I was sooooo upset, because they were having the rehearsal dinner that evening and wanted me there. The flight I was booked on now left at 11 am, arriving in SJU at 3 pm. That should have put me there for the rehearsal dinner around 5:30. Right. As I made my way off the plane, I went to the pickup area, expecting to be met by a driver, but nobody was waiting for me. (what a lonely feeling!!) I called the hotel, and she began checking, and came back and told me the driver was there – but his van had just been TOWED AWAY, and he was trying to get it back. After about an hour or more, he finally arrived to pick me up – and we were on our way – in Friday night rush hour traffic. UGH. At 6:30, I finally arrived at the beautiful little Villa Montana in Isabela. Paradise. This place had the small, intimate feel of a guest house, but was loaded with amenities and beauty. I was immediately greeted by many of her family members as I was rushed to the rehearsal dinner on the beach, and there was Eden, and I just fell in love with her – as I knew I would. That night, I got to know many of her guests, and met her family, as well as Eduardo’s. Ed’s family is from Puerto Rico, and were the most wonderful, gracious, and appreciative family I have met in a long time. I just knew the Jewish Interfaith wedding ceremony would be amazing. The next morning, I was able to spend quite a bit of time with Eden and Ed’s family and friends over breakfast on the beach. We spoke for hours about Eden and Eduardo, their personalities, experiences, and their lives. They told me incredible stories that really helped paint a perfect picture of my newest favorite Interfaith couple, and I was able to create a perfectly blended, earthy, universalist-style destination wedding ceremony that was a perfect match for their personalities. We even re-wrote the words to The 7 Blessings, taking the religious language down a notch, and focusing on the meaning and appreciation of life. It was quite beautiful. Watching Eden and Ed before me, as I performed their Jewish Interfaith marriage, was the perfect culmination of the experience. Standing before me was not only a couple in love, but two best friends, laughing, touching, giggling, beaming, and kvelling together. Knowing their closest friends and family were behind them, being witnesses to this magical moment, you could see the joy in their faces, and their hearts, as they spoke their vows to each other. Certainly, the destination wedding dinner party on the beach was also quite fun, and I had the most wonderful time with their friends and family. To everyone I met at the wedding ceremony – thank you for making me feel SO comfortable, and welcomed, and thank you for helping me create another beautiful destination wedding. Bob & Carol – thanks for the ride the next day to the airport, you are a wonderful couple! Paula & Ira – thank you SO much for your hospitality – and Eden & Ed – Mazel Tov and Buena Suerte. You are a beautiful couple that I will remember forever. See you in DC in May! What fun I am having in the city! I decided to extend my stay, and connect with some of my favorite people in NYC. After leaving Jersey yesterday, Sharon drove me into the Village, where I met Jenni and Mike, my newest fave couple I am marrying in May in Mexico. Jenni is the cutest, but after spending the day with both Jenni and Mike, it’s a race sometimes to decide who is actually cuter. 🙂 Mike is a doll. A total guy, but, with a deep sensitivity and loving, warm disposition, that makes anybody fall in love with him. It’s easy to see why Jenni did! But Jenni is as precious as they come, so, they’re a great match for each other. We went to a really cute restaurant in the village, The Cupping Room, and had an amazing lunch with a great bloody mary! Then, the Rock and Roll Hall of Fame exhibit was just down the street, and so we went there and had a great time, too. Jenni and Mike have the cutest little place in the Village, and it was great to see them in their personal surroundings, and really get the time to connect with them on such a personal level. I had so much fun! I met a friend in the city, and we went to Little Italy for dinner. Great food, great conversation – and back to the hotel to try to get a few hours of sleep before today began. This morning, I left the hotel bright and early and decided to get myself moving around the city. I took the subway down to Tribeca, and met Felix & Evelina at Mocca’s, on Church & Reade St. I browsed Canal street for a few minutes, but got totally overwhelmed, and thought better of it. You can’t do Canal Street alone, for sure. Tonight is going to be the BEST! I’m meeting the rest of the Aruba gang, Vlad & Tanya, and Max & Anna. (Where did Shilana go in this mix??) We’re meeting at Rockefeller Center, and it should be BIG fun! Tomorrow morning, I am going to see my best friend in NY’s daughter who goes to FIT, before heading back to Newark. Where did the time go? Well, I suppose nothing this great lasts forever, and I’m just so happy to have had this time. So – watch out tonight, NYC. Here comes Aruba!! !